The T.T. Wentworth Jr. Historical Foundation, Inc. has completed its final phase by placing a parting gift of more than $100,000 with Pensacola State College to establish a perpetual resource for distinguished teachers and scholars. The Mr. and Mrs. T.T. Wentworth Jr. Endowed Chair in American History honors both Rosabel and Theodore Thomas “Tom” Wentworth Jr. for their dedication in preserving and celebrating the history of Northwest Florida and the State of Florida. “For decades, the name T.T. 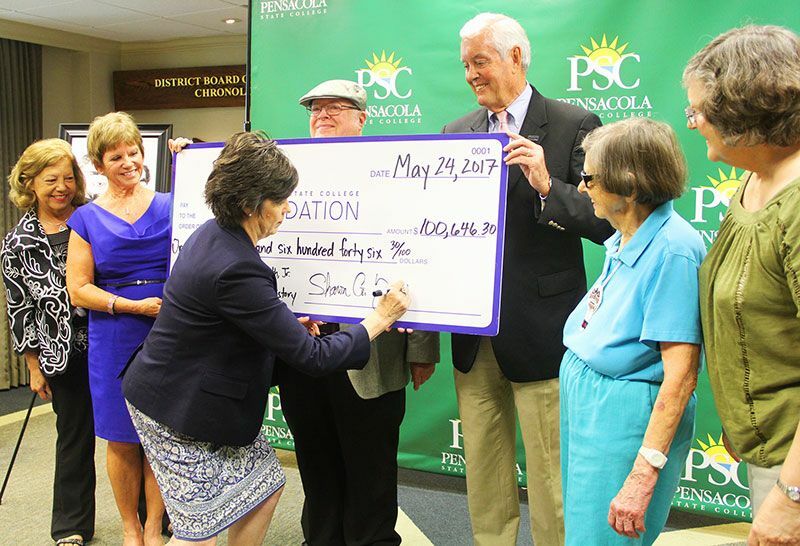 Wentworth Jr. has been synonymous with history and learning for students of all ages,” said Pensacola State President Ed Meadows. Often referred to as “Mr. History,” Tom Wentworth Jr. (1898-1989) was a Pensacola entrepreneur, collector, politician, educator, preservationist, community promoter and realtor. His collection of artifacts and miscellanea was organized as the T.T. Wentworth Jr. Florida State Museum in 1988. “Mr. Tom Wentworth loved preserving the history of West Florida, and he loved sharing his collection of historical artifacts with children and young people,” said Sharon Yancey, president of the T.T. Wentworth Jr. Historical Foundation. “As his foundation board began to realize its purpose had been achieved, we wanted a fitting way to celebrate this amazing legacy and historian. The Wentworth endowed chair is a three-year award that recognizes an outstanding professor/instructor in the PSC History, Languages, and Social Sciences Department and supports projects and professional development that benefit the recipient’s classroom performance and students. After announcing the establishment of the endowed chair on May 24, the T.T. Wentworth Jr. Historical Foundation held its final board meeting and dissolved the Foundation. 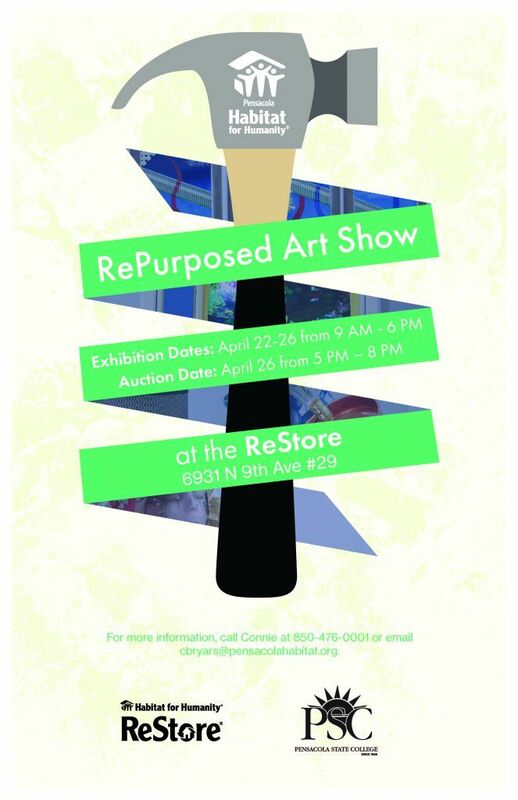 Dr. Jane Wentworth, daughter of Tom and Rosabel, recalled the Wentworth foundation has provided funds since the mid-1960s to help preserve the history of Northwest Florida and to assist in educating young people and preserving historical artifacts for future generations. 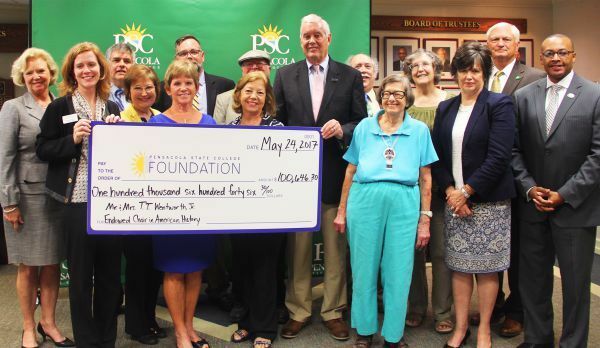 “It is with sadness that we are closing out the foundation, but with joy that the funds will be used by Pensacola State College to educate young people who are interested in history,” said Dr. Wentworth. “We are grateful to the college for establishing an endowed chair in American history in memory of my parents, Rosabel and T.T. Wentworth Jr. Serving on this historic executive board were Sharon Yancey, Steven Yancey, Randall Broxton, Brenda Rees and Karen Vano. Board members also include Lynne Robertson, Bea Belous, Jane Wentworth, Benjamin Wentworth, Karen Wentworth Penton and Elizabeth Benchley. “Mr. Tom and Mrs. Rosabel dedicated their lives to helping the community by supporting education, music and the Interstate Fair, to name a few,” said Broxton, a longtime Wentworth family friend and noted local historian. “Mr. Tom loved children and encouraged them to learn. 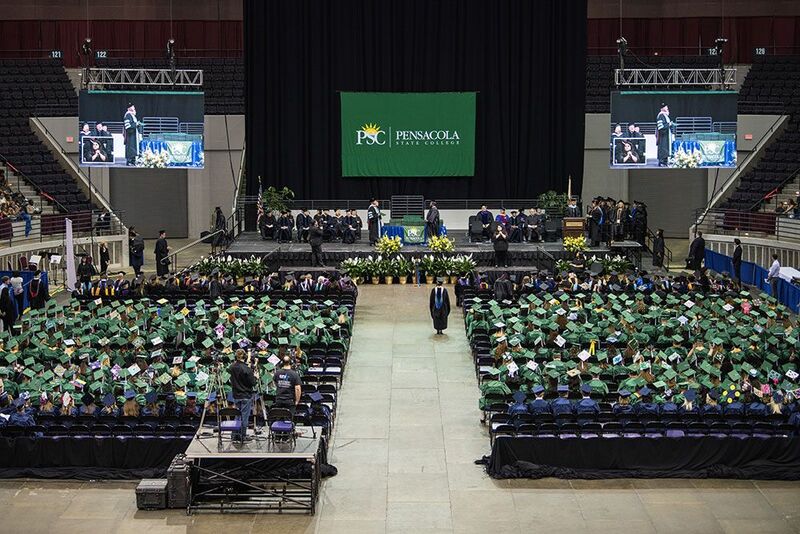 PSC Foundation President Mike Wiggins added that endowed chairs are among the most significant ways to recognize the talent and hard work of Pensacola State’s top faculty. “Providing funds that allow our faculty to embrace challenging projects and grow professionally elevate the entire college community. This gift from the T.T. Wentworth Jr. Historical Foundation will benefit Pensacola State faculty and students for years to come,” Wiggins said.